20 grams tube (approx. 20 sticks. 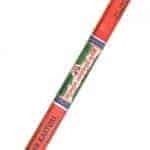 Charcoal based stick incense, India. Highly recommended by Rev. Nazirmoreh (ABRD). Favorite for many/ lingering, spicy, one-of-a-kind fragrance. I adore Green Rose incense: reminds me of when the Purple People were always at the French Market selling incense and exquisite perfumes.